Thanksgiving is approaching here in the US, and with it, the abundance of ads enticing us to do our Christmas shopping at their establishment. Many people will use this opportunity to upgrade their camera beyond their current point-and-shoot model. 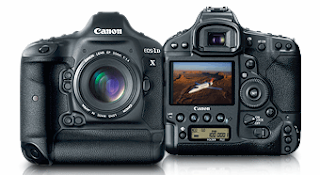 With the enormous selection of camera models available, how do you choose the right model? I'll give you a few guidelines below. Asking which camera is best is like asking which car is best. You can't answer that question without knowing what the buyer's needs are. Do you need something small and portable? Weather resistant? Impeccable image quality? Versatile? Convenient? Each of these needs could send you in a different direction. One major consideration is how far into the world of photography you want to get. If all you want is to take better photos of your kids' soccer/football games, then you can make your choice based on the features and price of an individual camera model. Test different models out in a store and choose whichever user interface you find most intuitive. If you think that you may eventually become a more serious photography hobbyist, then you need to need to consider the available upgrade path beyond your initial purchase. Of course, it goes without saying (but I will anyway) that budget limitations will determine the style of camera you can acquire. Fortunately, a low end, consumer grade DSLR kit (a body, lens, and frequently a bag) can be had for just $500. Despite their price, the image quality and amount of user control offered by these models will run circles around any point & shoot camera. For $1000, you'll have a lot more choices that are a step above the entry level models. New, sub-$1000 models are release every couple months, so it would be pointless to recommend specific models here. If this purchase will signal the start of a new hobby, then you need to choose your system (camera brand and lens mount) first. The big advantage of DSLR systems is that the lenses, flashes, and other accessories are all interchangeable. You can upgrade and add individual pieces here and there without having to replace the entire kit... as long as you stay within the same camera system. If you decide to change systems -- such as jumping from Canon to Nikon -- you'll have to sell all your old gear and start over from scratch, because very little of it will be compatible. The more gear you already have, the more expensive this move will be. Life will be better if you choose the proper system from the outset. When it comes to systems, Nikon and Canon are the big dogs. Nobody else can compete with their selection of lenses and accessories. If you can imagine a useful lens or accessory, it's probably available for Canon or Nikon. Virtually every pro uses one of those two. The second tier systems, like Olympus and Pentax, have a decent following that includes a few pros, but the selection of equipment (including compatible offerings from third party manufacturers) is more limited. Sony and Sigma are comparatively new to the DSLR world, so their long term expectations are still unknown. Once you get beyond the entry level kits, the big boys generally cost a bit more than the others. Different systems have different characteristics. For instance, Canon typically makes higher resolution sensors than Nikon, but Nikons perform better in low light. Canon and Nikon offer both "full frame sensors" and "crop sensors." 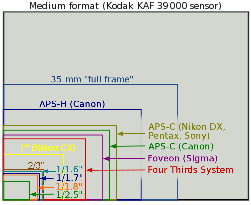 Full frame sensors are the same size as a frame of 35mm film (36x24mm). Crop sensors are smaller than that by varying amounts. "APS-C" sized sensors are roughly 22x15mm -- a 1.5x reduction. Pentax, Sony, and Sigma also makes APS-C sensors. 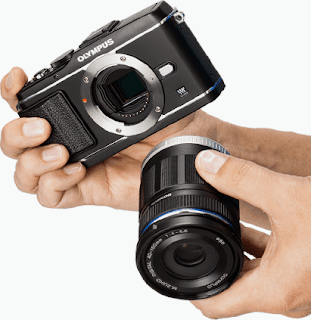 Olympus uses a "four thirds" sensor, which is exactly half the size of a full frame sensor (17x13mm). By comparison, most point & shoot (P&S) camera sensors measure only about 7x5mm. Cell phone sensors are smaller still. Many things are affected by the sensor size, and a full discussion is outside the scope of this article. One aspect has been detailed in a previous post. In short, larger sensors provide better image quality than smaller sensors, especially when the photo is taken in low light or when the image will be printed large. Smaller sensors magnify the reach of your telephoto lenses, which is helpful for sports and wildlife photography. Cameras with smaller sensors also cost a lot less. If you've already got a collection of older gear from an autofocus film camera, that equipment will generally still work on the same brand of DSLR. Note that Sony bought Minolta, so Minolta autofocus lenses still work on Sony DSLR's. If your lenses predate the autofocus era, you might still be tempted to stick with the same brand in the digital era so that you can keep using that old glass. Nikon and Pentax have retained the same camera mount for decades. Canon (and MILC's, see below) allows the use of other-brand lenses on newer bodies. 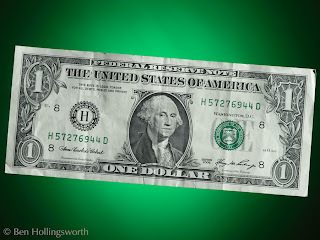 See this article for more info on using manual-focus glass. If durability and weather resistance are high on your priority list, I've got bad news. While there are several sub-$400 P&S cameras that are impervious to the elements, you won't find that same level of protection for less than $2000. Some cameras in the $1000-1500 range are water resistant, but they can't handle being dropped in the ocean, and they can't handle being dropped from head height onto concrete. Underwater housings can be bought for most major bodies, but they cost many hundreds of dollars. I'm not aware of any DSLR that can handle the level of physical abuse that a purpose-built P&S camera can, although the magnesium frames in high-end DSLR's will certainly hold up better to abuse than will the plastic frames in the consumer lines. If you're looking for something with better optics than a P&S, but that is still quite portable, you've got a huge and ever-growing range of options. Pro-grade DSLR's are the largest and heaviest you'll find. They're annoying to lug around, but the extra mass makes them very stable, and they fit better in your hand. Consumer-grade DSLR's are generally smaller and lighter, but they still won't really fit into most pockets. Just a few years ago, there wasn't much to fill the gap between P&S and DSLR cameras, but a whole new class of cameras has recently been created known as Mirrorless Interchangeable Lens Cameras (MILC's). They have interchangeable lenses, large sensors, and flash shoes like DSLR's, but they lack optical viewfinders and the associated mirror assembly. Instead, they rely solely on the rear LCD, just like a P&S. This allows manufacturers to reduce the size of the camera body significantly, to the point where some MILC's with a small lens attached could easily fit into a roomy pocket. These MILC's generally sit in the sub-$1000 price range. Panasonic and Olympus created the MILC classification with their line of "micro 4/3" sensors, which are the same size as, but incompatible with, the Olympus DSLR 4/3 mount. Since then, several other manufacturers have jumped on the MILC bandwagon with great success, each with their own proprietary lens mount. This is easily the fastest growing segment of the photo industry. Of course, due to their recent introduction, there aren't a huge number of lenses or accessories available, but that's not why you buy a MILC. The major lens options are generally available, so you've still got your basics covered. So far, I've talked only about camera bodies, but let's not forget about all the lens options. 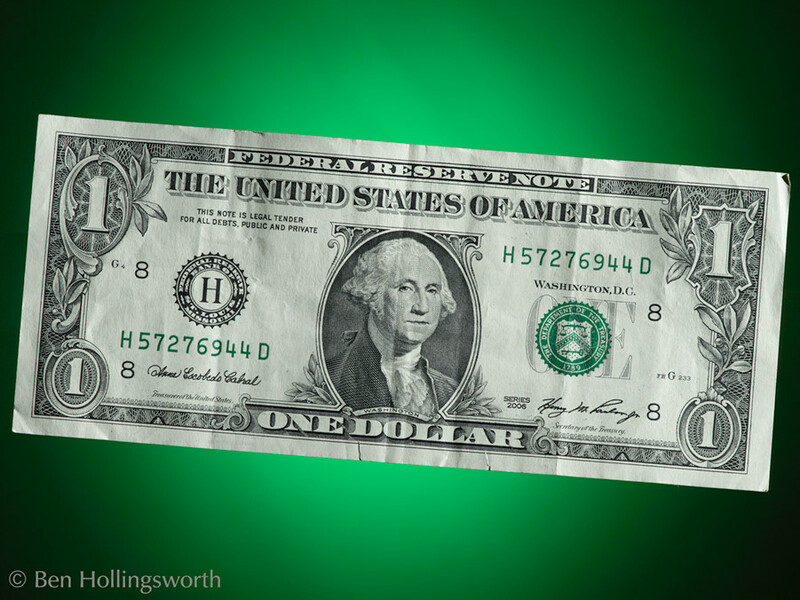 In general, you have to make a tradeoff among image quality, convenience, and price. Prime lenses -- those that have a fixed focal length and cannot zoom in & out -- typically contain the best optics and the best low-light capabilities at a relatively low price. They're also small and light weight. However, you'll frequently find your self swapping lenses or running about the room to capture the scene that you want. Not very convenient. For the record, 21 of the 29 lenses I own are primes. Zoom lenses offer the ultimate in convenience, but at the price of either image quality or money. Pro-grade zooms perform reasonably well in low light, but cost $1000 or more. Consumer grade zooms are less expensive -- sometimes under $200 -- but sacrifice quality. With zooms, you generally get the best image quality at the best price when your zoom range is limited. These lenses are "almost prime." Super-zoom lenses like the Tamron 18-270mm or Sigma's 50-500mm "bigma" cover an enormous range of focal lengths for the ultimate in convenience, but you may see distortions at the extremes of focal length and aperture. Of course, sometimes, convenience is what you need. If you're walking around a foreign town all day on vacation, you want to minimize bulk. If you're out in windy, dusty, or wet conditions, changing lenses can let a lot of undesirable crud inside your camera body. And obviously, if you're on a tight budget, covering all your basis with a single lens is a bonus. In all of these situations, a super-zoom is a great way to go. I could go on about this for hours, and I'd be happy to help you with specific examples if you can narrow down your criteria. Just speak up in the comments section below. Hopefully, the above will give you a good starting point from which you can help yourself or your shutterbug loved one make the jump to a nicer camera than they've currently got.